By July 1944 Poland had been occupied by the forces of Nazi Ger­many for close to five years and by those of the Soviet Union for con­sider­ably less. The Polish resis­tance Home Army (Armia Krajowa), which was loyal to the London-based Polish govern­ment-in-exile, had long plan­ned some form of insur­rec­tion against their Ger­man occu­piers. The Home Army’s ini­tial plan was to link up with the in­vading forces of the West­ern demo­cra­cies, which excluded the Soviet Union. How­ever, in 1943, with the inva­sion of West­ern Europe (it would be in Nor­mandy, France) months away, it appeared that the Red Army would reach the pre-war borders of Poland first. On this date in 1944 in War­saw’s suburbs, citi­zens heard the sounds of battle as Ger­man forces counter­attacked the approaching Soviets. 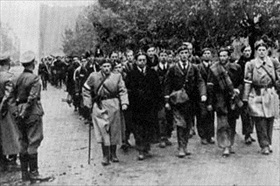 Two days later Soviet forces were on the defen­sive. Un­aware of this, the Home Army launched a revolt against their oppres­sors. Ger­man forces, including SS (Schutz­staffel) units, ruth­lessly put down the two-month-long War­saw Up­rising at a cost of 25,000 Ger­man casu­al­ties. By the time the Home Army capit­u­lated on Octo­ber 2, up­wards of 250,000 Poles had been killed—a quar­ter of War­saw’s popu­la­tion at the time—and 15,000 had been cap­tured. The Ger­mans ordered the city’s evacu­a­tion, and 350,000–550,000 civil­ians were passed through a transit camp on their way to death and con­cen­tra­tion camps or other loca­tions. The fero­city of the free­dom fighters enraged Ger­many’s leaders. Adolf Hitler declared, “War­saw has to be paci­fied, that is, razed to the ground,” and SS chief Heinrich Himm­ler issued orders to make the city “com­pletely dis­appear from the sur­face of the earth.” War­saw was to be turned into little more than a mili­tary transit station. The Ger­mans diverted con­sider­able resources to destroying the city. 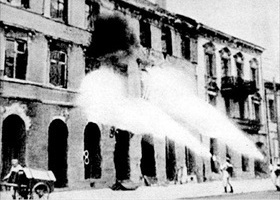 Demo­li­tion squads used flame­throwers and explo­sives to method­i­cally destroy buildings street by street, paying special atten­tion to histori­cal struc­tures, the Polish national ar­chives, and other places of national in­terest—this under the super­vi­sion of Ger­man scholars no less. By Janu­ary 1945, when War­saw was liber­ated at the start of a mas­sive new Soviet offen­sive, roughly 85 per­cent of the city lay in ruins. The Soviet offen­sive would take the Red Army to the former borders of the Reich on Janu­ary 26, 1945, and to the gates of Berlin on April 16. 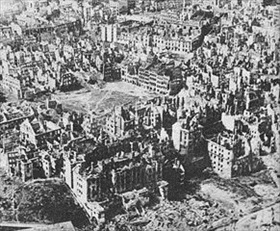 Left: An aerial view of Warsaw taken in January 1945. Post-war esti­mates of mate­rial losses were put at 10,455 buildings, 923 histo­rical buildings (94 per­cent), 25 churches, 14 libra­ries including the National Library, 81 pri­mary schools, 64 high schools, the Uni­ver­sity of War­saw, the War­saw Uni­ver­sity of Tech­nol­ogy, and most of the city’s his­tor­i­cal monu­ments. Almost a mil­lion inhab­i­tants lost all their possessions. 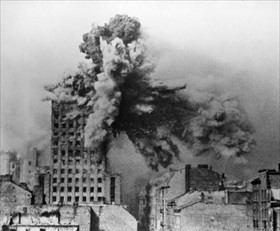 Right: On August 28, 1944, the Germans used “Mörser Karl,” a self-pro­pelled siege mor­tar, to fire 2‑ton mor­tar shells into the Pru­den­tial building, War­saw’s first skyscraper. Left: During the German invasion of Poland in 1939, much of War­saw’s Old Town was badly damaged by the Luft­waffe’s cam­paign of ter­ror bombing. 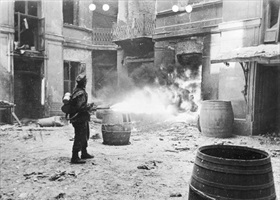 After the War­saw Uprising (August 1 to Octo­ber 2, 1944), what had been left standing was sys­tem­at­ically blown up or torched by flame-throwing units of Ger­man Army, as shown in this photo. The de­struc­tion of War­saw’s Old Town was so thorough that city fathers resorted to 18th‑cen­tury oil paintings and pre-war archi­tec­tural drawings to guide them in recon­struc­ting the his­toric dis­trict. The New Town was only par­tially restored to its former state. Left: Soldiers of the underground Polish Home Army sur­ren­der to the Ger­man Wehr­macht at a check­point in War­saw, Octo­ber 5, 1944, two days after their leaders had sur­ren­dered to the Ger­man Army in a for­mal signing cere­mony. According to the agree­ment, the Wehr­macht pro­mised to treat Home Army sol­diers in accor­dance with the Geneva Con­ven­tion, and to treat the civil­ian popu­la­tion humanely. But with­in days the entire civil­ian popu­la­tion of War­saw was expelled from the city. Out of a half million evac­uees, 90,000 were sent to labor camps in the Third Reich and 60,000 were shipped to death and con­centration camps. 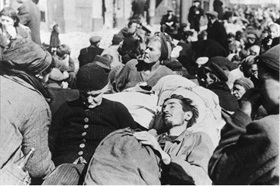 Right: Sick and starved people emerge from base­ments and sewers in War­saw in Octo­ber 1944, two months after the start of the War­saw Up­rising. Some people con­tinued hiding in the deserted city and were called “Robinson Crusoes” or “cave­men.” The Ger­mans called them “rats” and killed them when found. Among the best-known “Crusoes” was Władysław Szpil­man, whose memoire The Pianist was turned in a film of the same name.